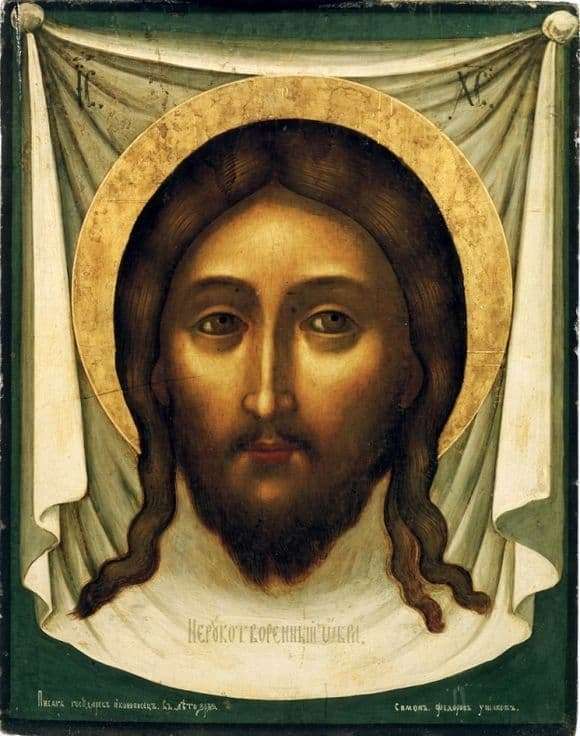 This icon was painted by Simon Ushakov specifically for the Church of the Trinity. The temple was painted in the period from 1628 to 1653 years. At the bottom, you can even see the inscription, which indicates the authorship of Ushakov. The naming of the board and inscriptions occurred in the 19th century. This is the earliest image of the Savior, which has reached our time. Already here you can see the characteristic techniques that predetermined all the work of this painter. On the icon, the features of the face are conveyed as naturally as possible. To simulate the required volume, a combination of color and shadow is used. It is created by a whole system of characteristic melts with the obligatory alternation of dark and light tones. In order to soften these transitions as much as possible, they are deadened at the final stage of work on this icon. The face is lit, but it is not motivated by any genuine light sources. Light highlights are traditionally located. Such techniques can be traced from the 14th century. Ushakov found reference points in terms of aesthetics and ideas in the history of this image. This image was mentioned in his treatise by Joseph Vladimirov. He was an associate and friend of Ushakov. According to this tactic, Christ is portrayed in the fleshly plane. This image, which managed to capture Simon Ushakov, and became the main subject of icon painting. It is important to convey it as accurately as possible, skillfully using light and shade and trying to make it as vivid as possible. The not-made image of Christ was sanctified by tradition itself. It was he who became a model for any icon painter. It was necessary to follow the generally accepted patterns as accurately as possible. This idea was formulated in the 17th century. In the icons of the master she joined with a great desire to depict Christ as lively as possible in order to maintain perfect transmission accuracy. This served as a stimulus for the search for the face of Christ, which would become a true ideal. Ushakov sought to find a specific new canon. He based it on a series of images of a later period.